Everything you need to know about kitchen flooring. When it comes to kitchens, you should never overlook the floor. It sometimes forms the starting point for the rest of your scheme. It’s easy to overlook kitchen flooring when you’re busy thinking about what units, appliances and added extras you’re going to have. The floor of your kitchen is likely to be one of the largest surface areas in the room, so its selection deserves careful thought. It needs to perform on many levels, in terms of durability, safety and ease of cleaning. It also needs to look great too! Your floor should work together with the rest of your kitchen so take the look and material of your units into consideration when selecting flooring. 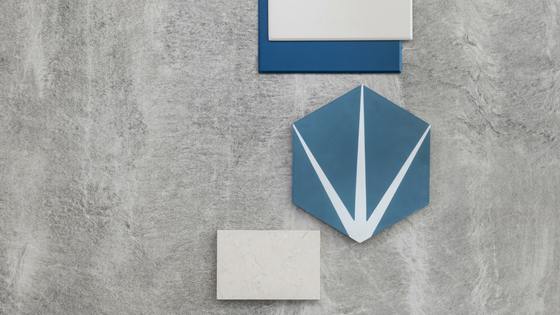 Materials such as encaustic cement and porcelain tiles look great in modern schemes, while natural stone tiles and warm wood planks suit traditional designs. There is a wide range of flooring materials available that can enhance your cooking space, but before you set your heart on a material, there are some important points to consider. We’ve made your life easy by putting together this simple list of things to consider when choosing your kitchen flooring. The flooring you choose for your kitchen should complement your units and worktop. Coordinate your scheme with a material that matches your worktop or add a focal point with flooring which contrasts. To coordinate, opt for materials with the same finish and match the colours closely. 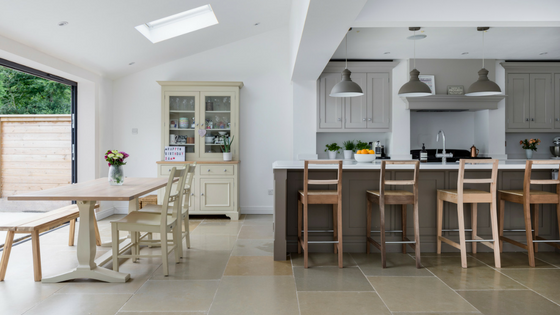 Choose a material that can be used for both worktops and floors, or opt for a walnut worktop and a warm limestone floor tile. For contrast, choose different colours in the same finish. Team a matt slate floor with a polished white granite worktop, for example. 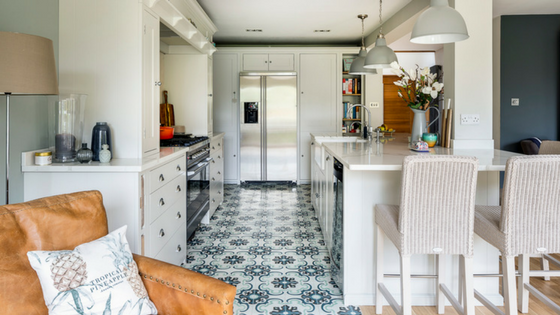 Or go all out with a pattern encaustic cement tile for an eye-catching design feature. 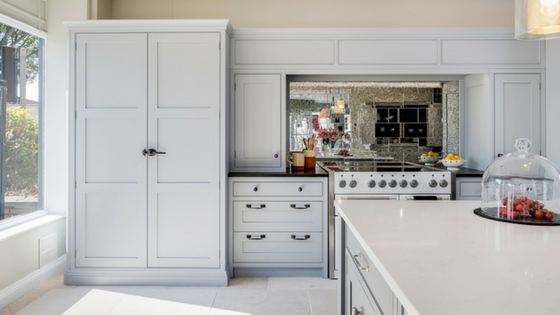 Whatever you choose, bear in mind that kitchens are a long-term investment, so make sure you won’t tire of the finishes or colours that you choose. Some flooring needs regular resealing and treating with specialist products. It’s a good idea to consider whether you’ll have time to maintain your kitchen floor or whether you’d prefer an easy-care material that you can sweep, mop and then forget about. Don’t be afraid to mix up materials in an open plan kitchen space. You could use durable, easy-clean flooring in cooking zones, like limestone, slate or porcelain, and for the dining and living spaces opt for wood planks, marble or encaustic tiles. Make sure you still like the flooring you loved in the showroom once it’s insitu in your home. The colour may look different when seen under different lighting, or the material may clash with your units or worktops. Remember that sealing can change the colour, so be sure to look at a sealed sample before you buy. Budget carefully to include all fitting costs and extra expenses for underlays, fixatives and grouts. If you intend to lay underfloor heating in your kitchen, be careful what you choose to lay over the top of it. While underfloor heating can be used with most modern flooring – stone is a great conductor and retains heat well – some wooden floors, particularly extra-wide boards, certain veneers and some types of adhesive, can be heat sensitive. Most flooring is best fitted by a professional. Some types of flooring need to be installed at the start of the kitchen design process, whereas others can be installed afterwards. Speak with your interior designer, retailer or manufacturer in advance to avoid any surprises.